Things are going bump-in-the-night in the St. Matthewâs House and Sophia thinks sheâs going insane. 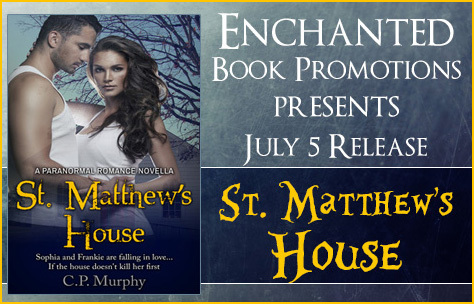 Her and Frankie are falling in loveâ¦.but the St. Matthewâs House has a mind of its own. First and foremost: I hate writing the dreaded bio! Iâm a writer, Iâm somewhat of an introvertâ¦so why would I want to talk about myself? Anyway, here I am. Iâve written poetry, though I admit I think Iâm a horrible poet, children stories, which are buried in my closet somewhere, and short stories. My father was a story teller and I grew to be just like him. I find myself making a story out of anything, from hikes in the woods, to letters in the mailbox. My imagination is always working. I often see an object and wonder were its been, who owned it, and try to create from it. Sometimes I want to give up writing. Itâs not easy to be a social butterfly and yet still make time to write. But then, my head explodes from characters who remind me that theyâre still lingering. They always win. I look forward to the day when I can write as often as I want. For employment I worked many years in the restaurant business, and many more years in retail. Iâm currently working in correctional healthcare, yes that means I work with inmates and you know my imagination runs wild.